All the flooding damaged 56 Nashville schools, the worst of which happened at Antioch Middle, Wright Middle, H.G. Hill Middle, Cameron Middle, Whites Creek Middle and the Academy at Opry Mills. And speaking of Opry-related things, Opryland will be closed for months trying to clean up all the damage they sustained when water gushed into the atrium. Davidson County was supposed to have some primary elections happening today, but since every last one of the voting machines we were going to use were kept in a flooded warehouse, they’re set be postponed for at least two weeks. 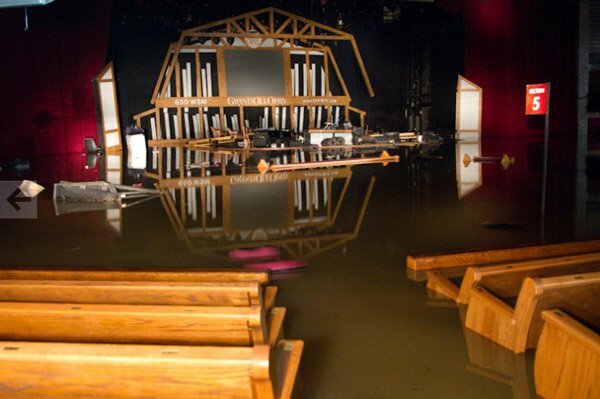 Our beautiful Schermerhorn Symphony Hall took some devastating hits this weekend, but the symphony hall is dry. Silver lining? One of our proudest moments through all this was seeing pictures of so many of you kids out slinging sandbags at MetroCenter yesterday. We also owe a big “thank you” to the inmates who saved our one remaining water treatment facility by a foot with their mad sandbagging skills. MTA’s bus and train services are still not operating today. Sadly, the death toll from the flooding and storms statewide has reached 18, with 10 alone in Davidson County. As the floodwaters recede, officials are worried that they’ll uncover even more victims. Governor Phil has requested that President Obama declare 52 of Tennessee’s 95 counties to be disaster areas. He says that assessment could take a while and cleanup even longer. Briley Parkway and I-24 are both seeing some residual traffic problems this morning, so check the TDOT Smartmap before you head out in either one of those directions. Among all the other things we have to deal with, the state Attorney General is warning retailers and other businesses that he will prosecute any instances of price gouging following the flood. Be on the lookout and use the consumer hotline to report any suspected gouging at 1-800-342-8385.